What is the betting that this "check on safety" will fail miserably and in a couple of weeks time we will yet again be reading about the annual increase in the death toll and related accident statistics for the Songkran period? Are these Police Blankets being offered on-line? Why Blankets? Better go for raincoats! 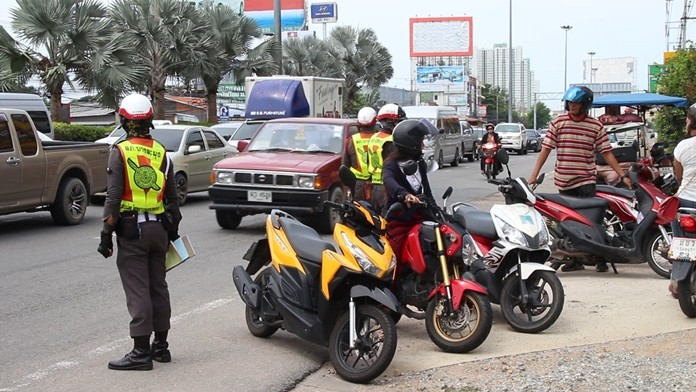 So.....After "Big Joke" comes "big blanket"
Came though Pattaya about 1 hour ago just one police man seen, lots of motorcyclists without helmets as is normal. "For the official April 13-15 holiday, all roads will be open with at least two police officers assigned to each major intersection. On April 18, the “wan lai” water festival day for Naklua, police will be stationed around the Dolphin Roundabout to support residents and check on safety." I live near Sukumvit road. How about motorcyclists driving down the footpath so they don't have to go to a intersection. 12 year old riding bikes with 2 younger friends on the back with water pistols, <deleted> looking at mobile phones whilst riding, inability to signal turning directions. You could always join the FPV, it doesn't sound like it would change your lifestyle too much. Part of Pattaya Plod's uniform; tight trousers round the crotch & latterly waistband; telephone; invisible ink pen for writing speeding tickets; voluminous wallet; dark glasses to prevent them seeing crime. The blankets also come with attached pillows to enable plod to nod.